So there I was. Spinning. 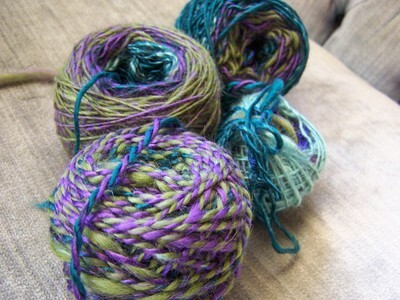 I pulled apart the layers and spun each color separately, or in a few instances (like the olive green and purple,) a few colors were swept up together. What I didn't want to do was to muddy the colors by blending all of them at once. Okay, fine. I maintained color clarity, and virtually the same twist and thickness throughout. Great. That's where things stopped being fun. I know that plying from a center pull ball is dangerous stuff. I know that there are certain fibers that get so curled up on themselves inside that ball that they knot to the point of no return. I know that certain fibers cling to each other with more strength than a grown man can pull apart. 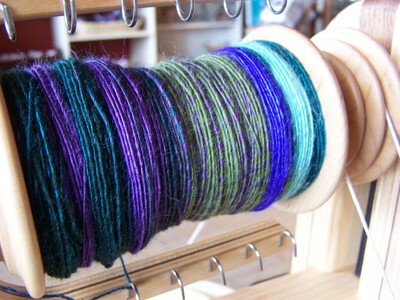 I know that certain fibers, at their weakest point, will break mid-ply, and leave you with a mere 12 yds on your bobbin. Deep down, I know that (for me) plying from a center-pull ball is just plain bad news. What I don't know is why I keep doing it.